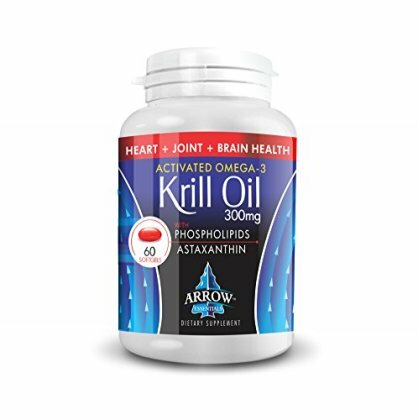 Arrow Essentials Krill Oil: 300mg of Supercharged EPA, DHA, and Astaxanthin to support Brain and Heart Health. Powerful Anti-Inflammatory and Anti-oxidant in phospholipid form. 60 count. KRILL OIL IS ABSORBED 5X FASTER AND MORE EFFECTIVE THAN FISH OIL. Fast absorption means more effective distribution of essential Omega 3, DHA and EPA than traditional fish oil pills. Give them a try, no fishy aftertaste!. "Krill Oil is more bio available than traditional fish oil pills." Doctor OZ. PROPRIETARY BLEND OF PREMIUM, SUSTAINABLE INGREDIENTS naturally combine with the powerhouse Antioxidant Astaxanthin. DHA & EPA Supports Joint Health, Brain Function, Cardiovascular Health. Astaxanthin is the next generation in antioxidants, the most potent antioxidant ever discovered, and a natural anti-inflammatory. FISH BURP FREE. Fresh Ingredients, quick absorbing phospholipids, and natural caramel flavor mean the fish burps are gone for good! FROM ARROW ESSENTIALS: CUTTING EDGE INGREDIENTS backed by scientific research. All Arrow Essentials products are made in USA at an FDA approved and inspected facility under GMP standards. Highest quality ingredients batch and date stamped for assurance of freshness. SUPPORTS: heart health, immune support, brain strength, and inflammatory ailments. Naturally Gluten Free, NON GMO, and Mercury Free. Astaxanthin is naturally occurring in Arrow Essentials Krill Oil, non-synthetic.